Rifle fire rips through the silence of the forest and fields on the slopes of Jastrebac mountain in southern Serbia. Two wolves have just fallen victim to a legal hunt. Forbidden in most of western Europe, the blood sport is allowed from July to April in this Balkan country, where wolves are not endangered. Around 800 of them roam the wild and depopulated mountains of southern Serbia, a region of mostly poor farmers and herders. It is not uncommon for wolves to attack livestock, especially in winter. "Last year they slaughtered four of my sheep in just five minutes," said farmer Ivan Milenkovic, who keeps around 60 sheep in the village of Dresnica. "I installed spotlights that light up every night to deter them," he told AFP. Other mountain residents take up arms during the hunting season to counter the wolf attacks. 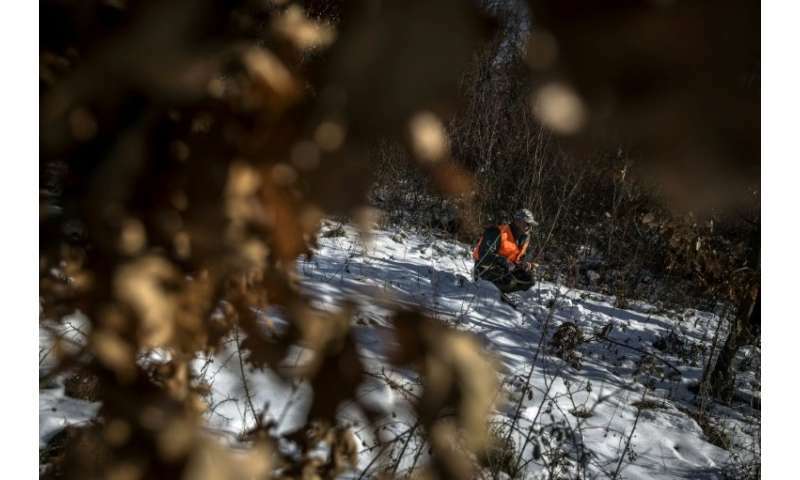 Local hunting associations that monitor the wolf population set quotas. On a recent cold winter's dawn, more than 400 hunters gathered near Blace, a town of about 5,000 people between the mountains of Jastrebac and Kopaonik. After swigging some rakija (local fruit brandy), the hunters split into two groups, the trackers and the watchers, and exchanged their traditional greeting: "Good vision and calm hand!" The silent watchers spread out in a line through the woods, while the trackers form another line a couple of kilometres away and walk towards the watchers, squeezing the gap between them which holds their prey. As they wait amid the trees, the watchers examine fresh wolf prints in the snow. According to regional hunting quotas, six wolves can be killed in the Blace area in one hunting season. "You wait your whole life to kill a wolf," said Dejan Pantelic, one of the hunters. "It's extremely rare, many never see it. I've been hunting for 24 years and I've not killed one." The wolf is smart with an exceptional sense of smell and hearing, the 42-year-old explained. And few animals are more mobile—the wolf can easily travel between 50 and 100 kilometres (31 and 62 miles) a day. "An isolated hunter has practically no chance of killing a wolf, only an organised hunt can yield results," Pantelic said. The Blace hunt has become a social event which has run for the past two decades, culminating with a feast that brings together hunters and villagers. Adults and children greet the hunters on their return, looking at them curiously. On the day AFP was invited to the hunt, the men who took part had killed two wolves and three foxes, whose bodies were then roped onto car bonnets. Local people had photographs taken of themselves and their children with the dead animals. Nikola Milincic, 24, was proud of shooting down a light-furred wolf just six years after his hunting debut. "I saw her at about 50 steps, I shot and I was successful," he said. "Some people wait for this moment for their whole hunting life, without success... Luck was with me today." The other successful hunter, Borica Vukicevic, had been waiting 38 years for "his wolf". The 63-year-old stood beside his catch, a she-wolf covered in dark grey fur and bearing sharp fangs that remained exposed in death. In the Balkans, wolf hunting is also allowed in Montenegro, Bosnia and Macedonia, but prohibited in Albania, Croatia and Kosovo. According to estimates from hunting associations, there are up to 3,000 wolves in Macedonia, about 800 in Bosnia, 500 in Montenegro, 400 in Kosovo, 300 in Albania and 200 in Croatia.